Our field crew visited Nan Zhuang Gou ("gou" meaning wash) in 1987 and 1988. Located about 11 km west of the town of Yushe, it was known to the French Jesuit E. Licent (his locality 24, Licent and Trassaert 1935). A village there now bears the name Nan Zhuang Cun ("cun" meaning village). Buckshot acquired the two microtine specimens from the area in 1935, but provenance data only allude to the town where they were purchased. Richard Tedford's research in the 1980s on AMNH specimens from Yushe Basin had already indicated that Buckshot's Nan Zhuang Gou collection came from at least two sources characterized by different modes of preservation. Many specimens preserved in a sandy matrix are stained and partially mineralized; others are little altered by fossilization, have fine grained matrix, and likely came from silty to sandy nodules in the base of loess overlying the local basin fill. Nan Zhuang Gou is located in the Yuncu subbasin of Yushe Basin, where the Sino-American team under Tedford and Qiu primarily conducted its field work (Figure 3). The stratigraphy there is local and applies only broadly to other subbasins. Sediments exposed near Nan Zhuang Gou occur in the top half of the unit named the Gaozhuang Formation and the overlying loess. The local Gaozhuang strata correlate to Chrons C3n1r and C3n2n, about 4.4 to 4.6 Ma. We found squirrels, hamsters, murines, early Germanomys, and primitive myospalacines there, but no Mimomys. There are many exposures of the overlying red and yellow loess at Nan Zhuang Gou, so it is quite possible that some fossils might come from those Pleistocene deposits. The general strike of the nearly flat Yushe sediments is northeast-southwest, age decreasing to the northwest. Immediately east and southeast of Nan Zhuang Gou are older Gaozhuang deposits assigned to Chron C3n2r, about 4.7 Ma. East of Nan Zhuang Gou (Figure 4 and Figure 5) are our productive site YS50 (within about 0.5 km), and 2 km away, the Yaergou Quarry (=YS57) that had produced the type specimen of the murine Chardinomys yusheensis Jacobs and Li (1982). It is quite conceivable that specimens from these older deposits could have made their way to Nan Zhuang Gou dragon bone dealers. Younger strata occur in the opposite direction. Near Nan Zhuang Gou deposits of about 4.2 Ma produce more advanced rodents plus early Mimomys. We place a hiatus in the section about 0.5 km to the northwest, where the rock becomes dominantly normally magnetized ("Gauss" age). 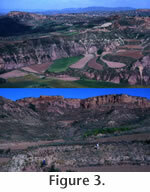 This is the type area of the Mazegou Formation, which contains mid-Pliocene faunas, including Mimomys (Cromeromys) irtyshensis, a derived species of Chardinomys, and the myospalacine Mesosiphneus paratingi (Flynn et al. 1997). Within about 2 km of Nan Zhuang Gou, up and down section, deposits ranging in age from about 4.7 to 3.4 Ma are encountered, all very accessible to early collectors amassing fossils for sale. It seems quite likely that old assemblages, such as the Frick collection, would include elements from throughout this fossil-rich sequence and from the overlying loess.